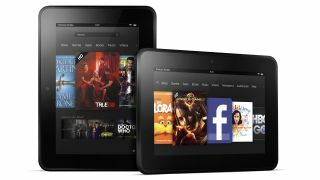 Amazon announced it will offer new features to help vision impaired users to the Kindle Fire and 7-inch Kindle Fire HD in the new year. The two features are a voice guide and explore by touch option, both of which help users by reading menus aloud in intuitive ways. Voice guide announces actions as they are performed, such as saying aloud a book's title and "book opened" when opening a book. Explore by touch is a more proactive option, announcing menu items and book titles as a user's finger swipes over them. A second tap then actually performs the menu action. Both voice guide and explore by touch are currently available on the 8.9-inch Kindle Fire HD, and in 2013 Amazon will expand the features to the standard definition Kindle Fire and smaller-sized Kindle Fire HD. The new features are designed to make the Kindle Fire more accessible to visually impaired users, who might have trouble reading text options on the smaller tablet screens. Amazon's Kindle devices have long supported text-to-speech options for ebooks, but providing those options for menus is a relatively new development for the company. "We have heard from thousands of customers who are vision-impaired that Kindle has made a difference in their lives," Amazon Kindle Vice President David Limp said. "With Kindle Fire HD 8.9 [inch] and soon our full line of new tablets, we are continuing our efforts to provide a range of accessibility features - voice guide, explore by touch, text-to-speech, optional text coloring and adjustable font sizes - for our vision-impaired customers." Amazon didn't announce a date when these accessibility features will arrive on Fires, only offering an "early 2013" timeframe.